The method, called theranostic imaging, targets and tracks potent drug therapies directly and only to cancer cells. It relies on binding an originally inactive form of drug chemotherapy, with an enzyme, to specific proteins on tumor cell surfaces and detecting the drug’s absorption into the tumor. The binding of the highly specific drug-protein complex, or nanoplex, to the cell surface allows it to get inside the cancerous cell, where the enzyme slowly activates the tumor-killing drug. Researchers say their findings, published in the journal American Chemical Society Nano online Aug. 6, are believed to be the first to show that chemotherapies can be precisely controlled at the molecular level to maximize their effectiveness against tumors, while also minimizing their side effects. 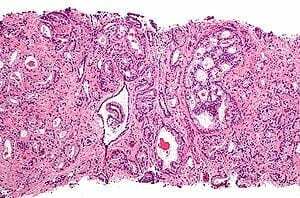 Senior study investigator Zaver Bhujwalla, Ph.D., a professor at the Johns Hopkins University School of Medicine and its Kimmel Cancer Center, notes that a persistent problem with current chemotherapy is that it attacks all kinds of cells and tissues, not just cancerous ones. In the theranostic imaging experiments, overseen by Bhujwalla and study co-investigator Martin Pomper, M.D., Ph.D., investigators directed drugs only to cancer cells, specifically those with prostate-specific membrane antigen, or PSMA cell surface proteins. “Our results show a non-invasive imaging approach to following and delivering targeted therapy to any cancer that expresses PSMA,” says Bhujwalla, who also serves as director of the Johns Hopkins In Vivo Cellular and Molecular Imaging Center (ICMIC), where the theranostic imaging studies were developed. Bhujwalla says the new technique potentially will work against any cancer in which tumors elevate production of certain cell surface proteins. Examples would include breast cancers with HER-2/neu and CXCR4 proteins, and some liver, lung and kidney cancers also known to express particular proteins. She notes that PSMA is expressed in the vessels of most solid tumors, suggesting that the nanoplex reported in the latest study could be used in general to image and treat a variety of cancers.